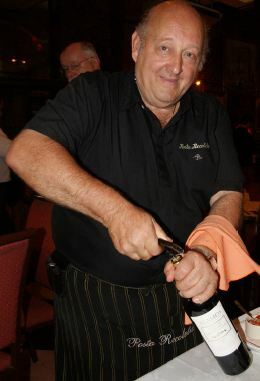 The first Malbec World Day is Sunday, April 17, 2011 and we are gearing up for it here at The Wine Economist. Plans include juicy steak and fresh asparagus along with a bottle of Malbec from Argentina. But which one? We tasted many wonderful wines during our recent trip to Argentina and each one provokes a memory. Difficult to choose. I went down into the cellar and grabbed a handful of likely suspects and asked Sue to make the choice. Wine is good, but wine and a story (if it is the right story) is much better. That’s one reason people spend time and money on wine tourism — to get the story behind the wines and meet the people involved in their creation. In the end, Sue’s selection for Malbec World Day was all about the story. The Alamos Selection Malbec (far right in the photo) reminds us of a dinner in Buenos Aires with our friends Scott and Janice. The parrilla’s gruff waiter grew impatient with our attempts to navigate his menu, so he just threw it away and got us to tell him what we wanted. Then he sorta threw that away too and, inspired by what the grill master did best, covered the table family-style with just what we would have ordered in the first place if we only knew how to do it. He recommended the Alamos and we went with that and were not disappointed. OK, so maybe he was not so grumpy after all. The Alamos story is wonderful to remember, but is it our celebration wine? No. Not because of the wine, but because of the story, which is more about our grumpy but lovable waiter and the delicious experience he provided and not quite enough about Malbec wine. Next up is the Catena Malbec. It conjures up the memory of our visit to Bodega Catena Zapata, which Laura Catena was kind enough to arrange for us. It was a memorable experience that included tastings of both the Luca and Catena Zapata wines with their respective winemakers. The Malbecs and other wines we tasted that day were among the very best we had in Mendoza (or probably ever will have anywhere). So is the Catena the choice? No, but only because we might rather have a Luca wine, since that is Laura Catena’s personal winery and we owe her so much for helping us with our visit. The only Luca wine in the cellar right now is the Beso de Dante, which is a Malbec blend. As good as it is, perhaps we need a pure Malbec to celebrate its world day. The Mendel Malbec is a different story. Sue was originally drawn to this winery because there are Mendels in the family and she thought we might be related. No family connection, alas, but our visits with owners Anabelle Sielecki (in Buenos Aires) and Roberto de la Mota (in Mendoza) were very warm and helpful. We learned so much through them about both Mendel wines and also the economics, politics, wine and people of Argentina. So it this Sue’s choice? No, she said. The wine is great and the meetings unforgettable, but the story is too personal for an “official” holiday like Malbec World Day. Save the Mendel for birthdays and anniversaries. Hard to argue with that sentiment. So that leaves the Achaval-Ferrer as Sue’s Malbec Day choice — but not by default. The story of our visit to this winery is, more than any of the others, about the wine itself and so the perfect choice for this celebration. 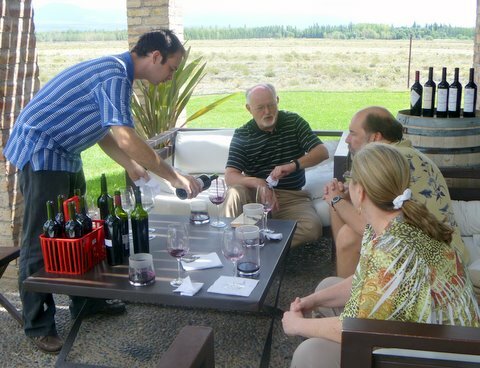 The tasting begins: Sue took this photo of Julian, Mike, Scott & Janice at Achaval-Ferrer. Santiago Achaval was called away to the U.S. for a marketing meeting (something we obviously understand here at The Wine Economist), so his assistant Julian organized a special tasting for us where we sampled each of their Malbec wines from both barrel and bottle and then tasted each of the component wines of the Quimera blend alongside the finished wine. Visitors stared at us in wonder as the table filled with bottles and glasses. As a special treat, Santiago had arranged for us to taste barrel samples of the Hand of God wine that he is making in partnership with Jon Staenberg (who kindly introduced me to Santiago for the purpose of this visit). This made the visit all the more memorable. I cannot imagine a more intense examination of Argentinean Malbec terroir, which makes the Achaval-Ferrer our perfect wine for this year’s Malbec World Day celebration! « Is Malbec Washington’s Next Big Thing? There’s always a reason for a celebration. According to The Esquire Drink Book, published in 1956, The 17th meant it was just 252 days to Christmas and the 18th is the anniversary of Paul Revere’s Ride. Holiday Insights says the 17th is also National Cheeseball Day. Every sailor knows the yardarm is “that which the sun is always over.” Just about every day is a Saint’s Day. And Mike, if April 17th is World Malbec day, when is World Sangiovese day? I think Sangiovese World Day should be like the Mad Hatter’s “unbirthday” in Alice — any day you like!